Polishes both painted and bare aluminum surfaces. Simply amazing removal of oxidation, chalking, and water spots quickly and easily. 3M's Aluminum Boat Restorer and Boat Polish is perfect for removing oxidation growth and stains to restore that lustrous appearance to your boat's aluminum. Do not use on anodized aluminum. 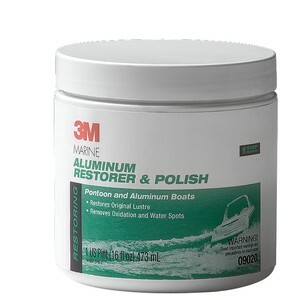 3M's Aluminum Boat Restorer and Boat Polish is perfect for removing oxidation growth and stains to restore that lustrous appearance to your boat's aluminum. This aluminum boat restorer and boat polish is also perfect for removing heavy oxidation and restoring shine to most painted surfaces. Be sure to test on a small area prior to use. Not recommended for anodized aluminum.